The Admit Card is a document to the candidate which acts as an ID proof to appear the examination. View the Admit Cards for All Entrance Exams conducted in India. The Various Entrance Exams are EAMCET, ECET, ICET, GATE, JEE Mains, JEE Advanced, NEET etc. 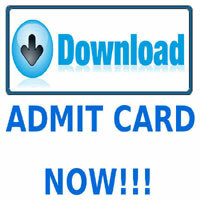 Also get the steps to download the Admit Card of the respective exam also. Candidates who are searching for Admit Cards/ Hall tickets/ Call Letter for various Government Jobs can download them here on this page. One of the important necessarily document to appear for the written exam is Admit card. Sometimes Admit Card is also called as Hall Ticket. A candidate those who want to appear for an exam must carry the concern exam hall ticket to the examination hall. Also, he/she should keep the Exam HallTicket safely until the admission process completed. We updated all the information related to the Latest Govt Jobs Admit Cards such releasing date, official Website etc.., applicants can check them and download their admit cards if they have applied for any Recruitment Examination. Admit cards are very important for any Examination. It is must and should that candidate had to carry their Admit Card/Hall ticket to the examination center. Applicants will not be allowed into the test center if they don’t have Admit Card. Candidates must be noted that the officials dispatch the admit cards to the candidates those who submit the application form of the respective exam before the last date. So, it is important to every candidate to register for the exam before the deadline only. In general, the admit card will be issued a 15 days before the exam date. So, students those want to take the written exam may download the Hall Ticket from the scheduled date until the exam date at the official website. The Examination board will ask the candidate to submit the hall ticket during the counselling process and at the time of admission as well. Candidates must be noted that the officials dispatch the admit cards to the candidates those who submit the application form of the respective exam before the last date. So, it is important to every candidate to register for the exam before the deadline only. In general, the admit card will be issued a 15 days before the exam date. So, students those want to take the written exam may download the Hall Ticket from the scheduled date until the exam date at the official website. Every year, so many entrance exam notifications release by the different authorities across the country. This to provide admissions to the various Engineering, Medical and Agricultural, pharmacy, management, fashion technology and other courses. So, once the notification announced by the officials, most of the candidates those who are eligible to appear the exam have applied. After the successful completion of the application form and preparation process, all are searching for the link to download the Hall Ticket. For any examination, the Hall Ticket is treated as a token for the students. So, once the application process completed by the officials, many of the applied candidates are eagerly looking for the Hall Ticket to carry for the test centres. There are various advantages by downloading the Admit Card. So, once download the Admit Card of the exam, you need to verify the details on the printed admit card. The Hall Ticket contains details are as follows. The photograph uploaded at the time of application submission process. Venue details and its complete details. Finally, We are the team of entranceexams.io to provide the admit cards for all exams. Here you will also get the state wise as well as central wise exam hall tickets. So, just follow the below tabular form and get the direct link to download the Respective exam Hall Ticket. If you have any doubts related to the info which provided on this page, please comment on the comment box.